The silly minigame from Undertale is now a full game. And by full game I mean barely more complex. Select your snail and mash buttons to encourage it across the finish line. Don't encourage it too much though or it may overheat. I did this in a weekend when I couldn't work on anything else. It's badly coded and not well polished. Enjoy! Slowly and sensually unzip the archive file. Not too fast - savor it. Then start digging deep into that file hole called Thundersnail. Feel free to rummage around in there. Poke and prod all you want, I won't mind. When you're ready to get down to business, feel out the file thundersnail.exe. Make sure your cursor is rubbing on it nice and gently, then click it. Then click it again. Oh god click it twice! It's opening! Yes! Whew. That was good. 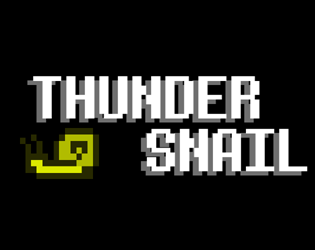 You're playing Thundersnail now. I hope it's as good for you.